Wedding cakes: Please book your cake 1-8 months in advance, especially during peak seasons. 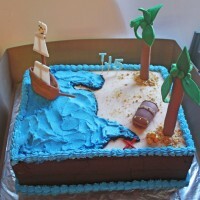 Custom designed / novelty cakes: Please book your cake at least 1 week in advance of your event. Some artwork on cakes takes longer to make than other types, for example figurines. Any of these specialised items are subject to time availability and while we always try to accommodate late orders, sometimes if notice is too short, it’s just not possible. Standard birthday or other bakery cakes: Please book your cake at least 4 days in advance. Short notice requests are subject to availability. Platters or other party eats: Please book your platter at least 4 days in advance. Short notice requests are subject to availability. We are sometimes able to accommodate last minute requests, don't be afraid to ASK! 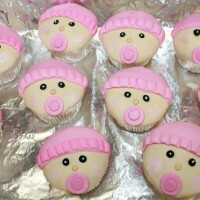 We always try to accommodate late orders and even accept same day orders if we can. This however, places a lot of pressure on our bakery and we ask that if at all possible, you give us at least a few days’ notice. A 50% non-refundable deposit is required on all orders. Delivery order: balance MUST be paid 5 days prior to the date of delivery. Custom design cakes vary in price according to time, design, type of cake and fillings, serving size and how involved the design is. We can provide you with an estimate if you provide us with pictures, serving requirements and design ideas. 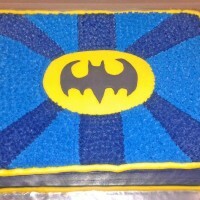 Please consider a budget for your cake, as this is extremely helpful in providing design options. An order can be placed via email, telephonically or face to face at our shop. We deliver orders on request and subject to time availability. If you need an order to be delivered, please book your order well in advance. Orders of more than R500 will be delivered free of charge, within Alberton only and subject to time availability. Orders under this amount or outside the borders of Alberton, will incur a delivery charge and is also subject to time availability. With the exception of same-week orders, orders may be cancelled within 24 hours of placing order and a refund will be issued. For larger orders such as wedding cakes or catering for large events, written cancellation notice must be received no later than 30 days prior to the event date. Any cancellation of an order already paid for, will be subject to management approval and if such approval is granted, a gift card will be issued. No cash refunds will be made. If you wish to cancel your order and we have already started with artwork, we may be unable to cancel your order or the artwork may be deducted from the gift card issued as refund. 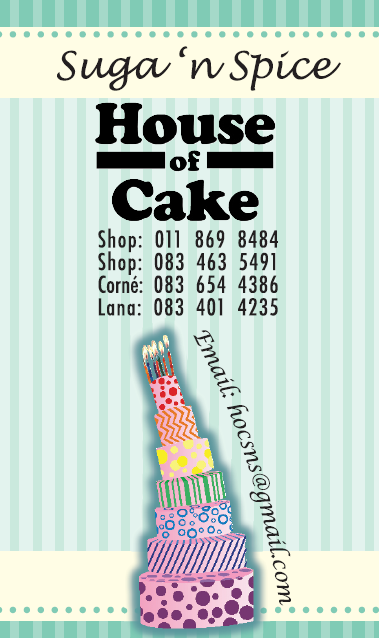 Egg free, gluten free, diabetic friendly, banting and vegan cakes, vegetarian platters. Please contact us to enquire about our current range of special needs products. Didn't see an answer to your question? Send us an email!